How to Root New Nexus 7! - 2013 Model ~ AndroidRootz.com | Source for Android Rooting, ROMS, Tricks and More! This guide will show you how to root your new Nexus 7 (2013 model) by flashing a custom recovery and then installing Chainfire's SuperSU zip file. The entire process is fairly simple and will take about 15 minutes. If your still wondering why you should root your Nexus 7 here a couple of reason why you should: Backup and restore apps + app data, install custom ROMS, increase battery life, overclock, underclock, and so much more! 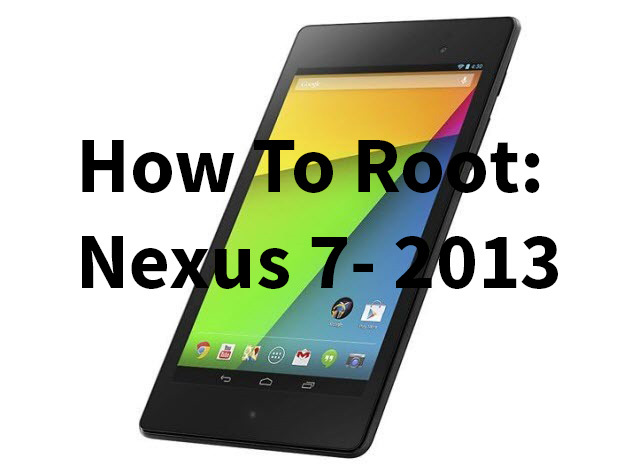 Use the guide below to root your Nexus 7 2013 model. Warning! This will wipe everything off your phone! Backup your music, contacts, movies, etc. You have been warned! 1. Turn off your tablet, then press the volume down and power button at the same time. You will see a red text with "Restart bootloader". This is called fastboot mode. 2. Plug in your tablet to your computer via microUSB. Use the OEM USB cable to make it less likely to run into problems later into the process. 3. Download Nexus7RootNew.zip and UPDATE-SuperSU-v1.51.zip using the links below.